This classic stationary sofa features a shaped seat back and rolled arms for a truly ageless silhouette that will stand the test of time. 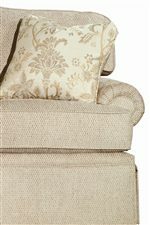 Accent pillows adorn each armrest for a designer look, while a reinforced skirt with center pleats lines the base for a beautiful and classic finish. Superior coil construction and extra padding ensure a truly comfortable sofa that will be enjoyed by both you and your guests. 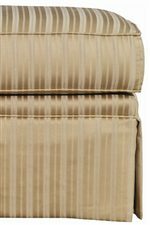 More than 1,000 designer fabric choices even let you customize the final look of this sofa for a style that blends seamlessly with existing living room decor. The Baltimore Traditional Sofa with Rolled Arms by Kincaid Furniture at AHFA in the area. Product availability may vary. Contact us for the most current availability on this product. Arm Inside of rolled arm is padded for comfort, lending authenticity and style. Leg or Skirt Hand-rubbed finish, solid hardwood legs.